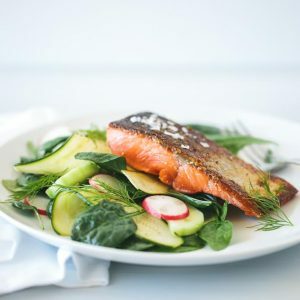 Crispy Skin Salmon with Zucchini, Cucumber and Dill Salad is a perfect light meal for a hot day. It's gluten-free, paleo, and whole30 friendly. Make the salad by tossing the spinach, zucchini, cucumber and radishes together in a bowl. Set aside. Add the avocado oil to a large, non-stick sauté pan on medium-high heat. Place the salmon skin side down and cook for 4-5 minutes. Leave the pan uncovered, but use a splatter guard to protect from hot oil splatters. Flip the salmon and cook for an additional minute. Divide your salad mix between the plates and top with a piece of salmon. Sprinkle with salt and pepper. Garnish with dill and drizzle the cucumber dill vinaigrette on top.